Herbert S. Lustig, M.D. (Bala Cynwyd) - Book Appointment Online! =================== **DR. LUSTIG IS NOT A PROVIDER IN ANY INSURANCE PLANS** =================== PLEASE MAKE APPOINTMENTS for yourself, for a minor in your custody or for your dependent -- but NOT for other adults who are capable of requesting appointments for themselves. =================== For 45 years, Dr. Lustig has provided private outpatient psychiatric services to Children, Adults & Families who are experiencing difficulty with the quality of their functioning or with their social environments. In addition to performing a short consultation or a comprehensive diagnostic evaluation, Dr. Lustig offers a broad range of treatment modalities –- including time-limited or longer-term psychotherapy,and the prescribing of psychiatric medications when indicated. 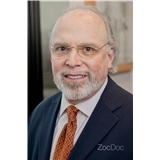 Dr. Lustig engages his patient in a confidential collaboration that is tailored to the patient's unique circumstances and skills, and in which the patient makes informed decisions about the treatment they'll be receiving. Dr. Lustig schedules all office visits, and handles all phone calls and paperwork. Fabulous! Headed back again tomorrow.